On November 21, 1924, the Frederick Street Colored School gave a program at 8:30 PM. There were selections by the high school orchestra. Talks were given by Lawrence Males, W. Inez Cohran, Mae McIntyre, E. L. Browne, H. V. Talbot, and a solo was sung by Miss A. G. Taylor. A piano selection was given by Edith Cooper. Remarks were made by the principal and the program closed with a selection by the orchestra. On November 11, 1925, several thousand school children representing the public and parochial schools of the City participated in the Armistice Day Parade. The First Western Maryland Band, one of the oldest band organizations in Cumberland, had the largest number of musicians in line. On February 16, 1899, the sacred cantata, "Mary of Bethany," was rendered at the McKendree Methodist Episcopal Church. On February 22, 1899, a party of young Black people went to Piedmont to attend a cake walk and ball. 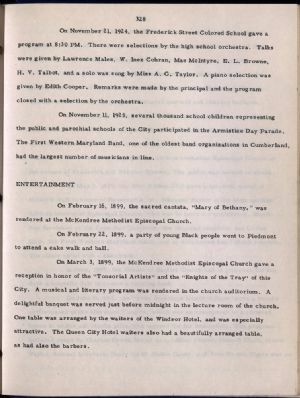 On March 3, 1899, the McKendree Methodist Episcopal Church gave a reception in honor of the "Tonsorial Artists" and the "Knights of the Tray" of this City. A musical and literary program was rendered in the church auditorium. A delightful banquet was served just before midnight in the lecture room of the church. One table was arranged by the waiters of the Windsor Hotel, and was especially attractive. The Queen City Hotel waiters also had a beautifully arranged table, as had also the barbers.